Revani (reh -vah-NEE) (also spelled Ravani) is not difficult to make and is a delightful addition to any sweet table. It is a semolina sponge cake with a touch of lemon and sweetened with a simple syrup flavored with orange zest. Semolina is durum wheat that is more coarsely ground than regular wheat flours. 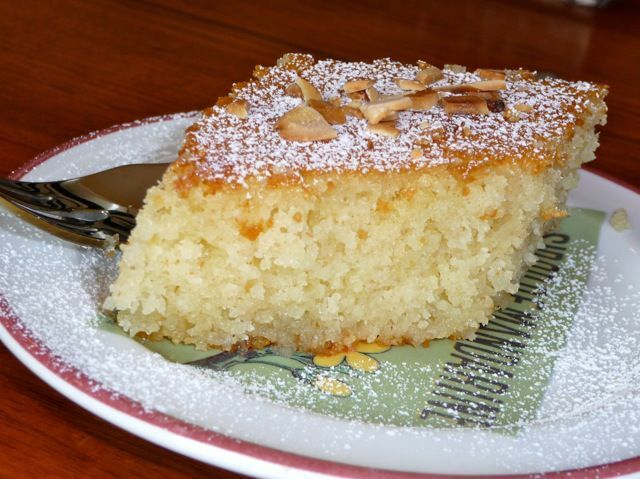 Therefore, semolina can cause the cake to have somewhat of a coarse texture (especially if you don't use fine semolina, which this recipe calls for). But this flavor combination, as well as the citrus syrup, results in a delicious and moist dessert. You will want to make sure the syrup cools completely before spooning over the warm sponge cake or else the cake will become soggy. As Revani is popular in throughout the eastern Mediterranean countries, you will find slightly different versions depending on the recipe's origin. Check out Turkish Semolina Cake in Syrup for a subtle twist on this simple recipe. Preheat the oven to 350 F. Grease the bottom and sides a 9 x 13 pan and set aside. Mix the flour, semolina and baking powder in a medium bowl. Using an electric mixer, cream the butter with sugar until light and fluffy. With the mixer running, add egg yolks one by one. Continue mixing until the batter turns a light yellow color. Add vanilla extract and lemon zest. With the mixer on low speed, add the flour mixture in three batches alternating with the milk. Clean the beaters well and beat the egg whites in a separate bowl with a pinch of salt until soft peaks form. Using a spatula, fold the egg whites into the batter until just blended. Don't mix too much or you will "flatten" your egg whites. Pour the batter into the pan, level with a spatula and bake for 45 minutes or until the cake is a nice golden color. Add water, sugar, and orange zest to a saucepan and bring to a boil. Simmer for 5 minutes. Add the lemon juice and cool. While the cake is still warm, cover it with the syrup. When the cake cools, you can sprinkle with some powdered sugar, cinnamon, and the almonds, if you're using them.